The Refillery – Fill up. Feel good. We refill your containers with eco-friendly, package-free, locally made soaps, detergents and cleaners. We also sell basic “zero waste” accessories, and consult with businesses and homes to reduce their waste footprints. 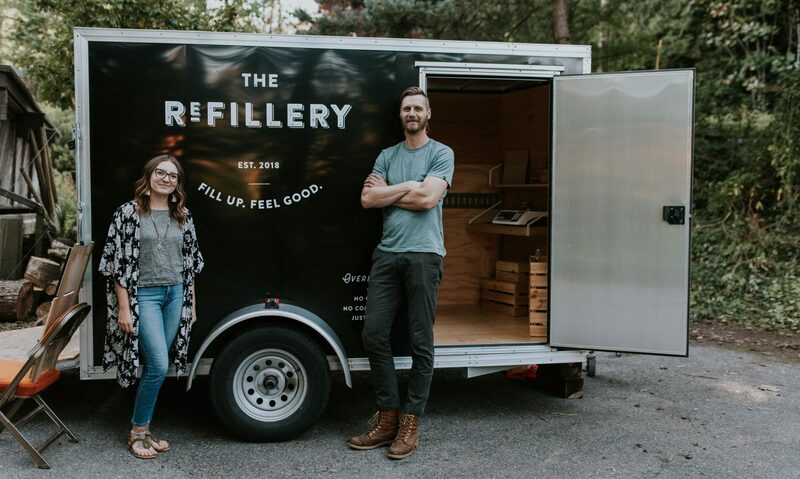 Co-founders Erika Arnold and Nate Lepp are honored to be a part of a growing movement – right here in Chilliwack – to care more deeply for our local lands, waterways and wildlife, while bringing you a retail experience that feels relational and restorative. You’ll find our Refillery trailer at 5643 Vedder Rd, parked behind Mt. Waddington’s Outdoors. Hours are 10am-6pm on Wednesdays and 10am-5pm on Saturdays. Check our Instagram or Facebook for updates on visits to other locations, including occasional visits to Abbotsford. Dish soap, dishwasher powder, hand soap, all-purpose cleaner, countertop cleanser, laundry detergent, shampoo, conditioner, body wash, moisturizing skin cream, castile soap and bar soap. What kinds of containers do I need? If it holds liquid, we’ll fill it. Your empty pump dispensers, squeeze bottles and detergent containers will work just fine. Mason jars, swing-top beer bottles and growlers work great too. We always recommend starting with something you already have, or taking one of our free donated jars, but we also sell refillable containers if you’re in need. What happens to the bulk containers you refill from? Once empty, we return them to our local suppliers, where they’re refilled and reused, again and again, for a long, long time. You’ll find natural deodorant, brushes for dish washing, dish/cleaning cloths, beeswax wrap and lunch bags, produce/bulk bags, toothbrushes, on-the-go cutlery sets, reusable straws + cleaners, funnels, take-out containers for food and more. I bought some laundry detergent, all-purpose cleaner or dishwasher detergent. How much should I use? For laundry detergent in either a standard or HE washing machine, use 1/8 cup for regular loads and 1/4 cup for large or very soiled loads. For cleaner, dilute 1-2 Tbsp in a litre of water for smaller jobs, 1/4 cup for 4 litres for larger jobs. For dishwasher detergent, use 1 tablespoon in the main-wash cup. For extra cleaning power, you can add 1 teaspoon to the pre-wash cup. Can you help my home or business reduce its waste footprint? Yes, we can. Erika, one of our co-founders, won a 2018 Chamber of Excellence Award for Sustainability as a result of her work with Studio B Yoga. To inquire about a consultation, email erika@refillery.co.